One of the elements that helped exacerbate the recent sell-off was the Binance hack. It’s not exactly clear what caused the issues at the popular exchange, but what is known is that numerous users reported their coins being sold off at random, without their knowledge or consent. This led to the speculation that a hack occurred at the crypto exchange, which in turn caused Bitcoin and other digital assets to sell off. Bitcoin cratered by about 7% in minutes following the news. 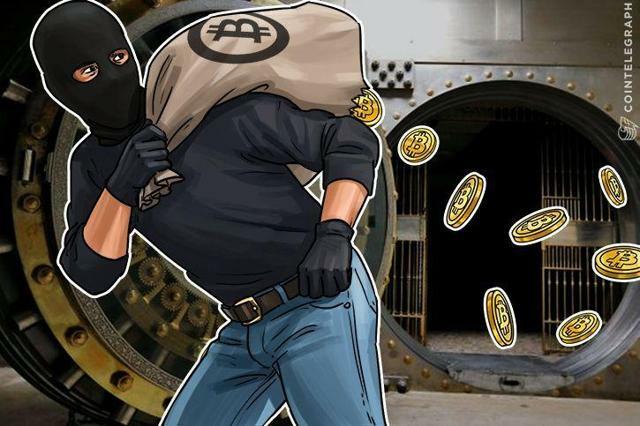 This Binance hack is an additional problem at a time when Bitcoin is already being confronted with so many challenges. This incident is another example of why more rigorous regulation is needed in the exchange space. But it also creates an additional element of uncertainty and mistrust in the segment, causing many to speculate about the safety of crypto trading once again. At approximately the same time as the Binance incident, the SEC came out with an ominous warning signal to the crypto world. The statement suggested that further scrutiny of cryptocurrency exchanges was needed, and that the SEC was ready to hand out subpoenas to those that did not comply with the new rules. This piled additional selling pressure on top of the Binance news, which caused the sell-off to accelerate, prompting Bitcoin’s drop to increase to over 10% in just minutes. This also drove Bitcoin to fall through the all-important $10K mark. Next, Japan, probably the world’s friendliest market for crypto trading, suspended trading at two of the country’s major exchanges, Bitstation and FSHO. 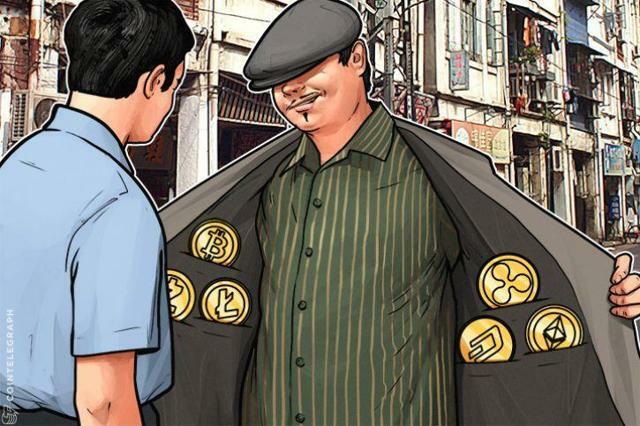 Reportedly, one of Bitstation’s executives used customer funds to conduct personal transactions. And FSHO failed to shore up customer protection. In addition, the country’s financial services agency imposed penalties on five other exchanges, due to their failure to improve security meant to prevent further cyber attacks. While the issues discussed above may prove to be transient in nature, there is one notable factor that cannot be ignored. The elephant in the room that is causing Bitcoin’s price to plummet is the apparent loss of appetite for Bitcoin. Ever since the drop occurred from $20K, Bitcoin has been steadily losing its popularity. In stark contrast to what we saw going into year-end, financial pundits are paying it very little mind these days, people are talking much less Bitcoin at the dinner table, trading volumes have dropped off significantly, even Bitcoin articles are attracting fewer readers and prompting less commentary. Everything is pointing to a loss of interest in Bitcoin, it appears that people are “Bitcoined out” a bit. Whether this will be a transitory or a lasting phenomenon remains to be seen. 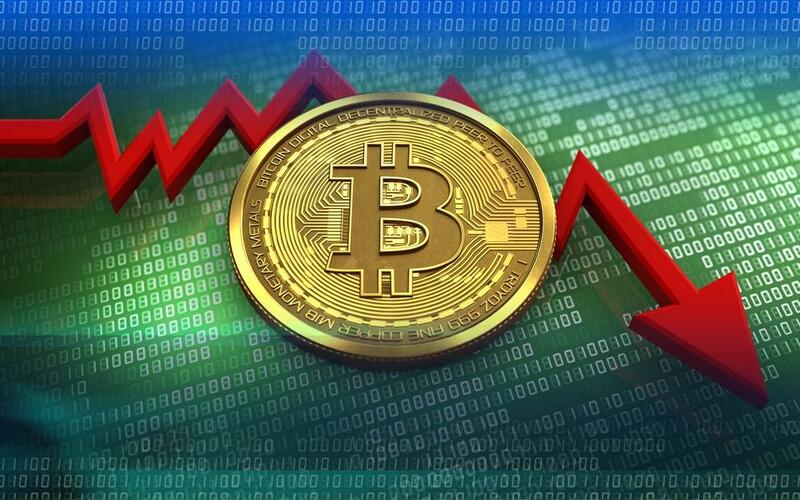 But what is certain is that sentiment drives price in Bitcoin, and with an apparent loss in popularity, sentiment seems to be turning decisively more pessimistic, which is leading to the current price decay. And it’s not just Bitcoin, the whole cryptocurrency complex appears to be struggling. 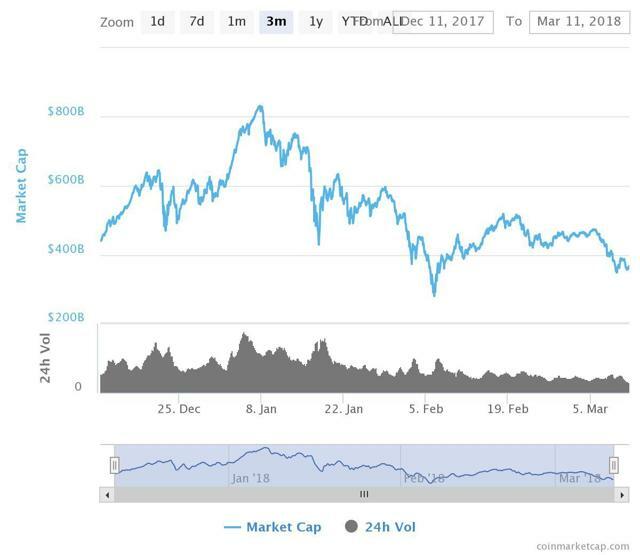 The cryptocurrency complex’s market cap chart shows that the value of digital assets has declined dramatically since it hit a combined value of over $800 billion. Now the market cap threatens to retest the $300 billion level. If this level fails, it could open the door to panic selling in some of these assets. While the short-term picture arguably looks grim for Bitcoin, there are a few favorable developments on the horizon. For instance, there may be some meaningful regulatory breakthroughs in South Korea soon. The proposed legislation aims to legalize Bitcoin and officially classify it as a “liquid asset” in the country. South Korea is a key market for Bitcoin, third only to the U.S. and Japan. Once the regulatory issues are resolved, more liquidity will enter the Bitcoin market, and should create a more stable atmosphere concerning Bitcoin trading in general. Also, there is the implementation of the Lightning Network, which promises to solve many of the functional inconveniences associated with Bitcoin, mainly scale, speed, and cost. The system appears to be functioning as intended, and is in the opening stages of its expansionary cycle. It is possible that the LN will become widely adopted over time, which could enable Bitcoin to become an effective worldwide medium of exchange instrument someday. With further adoption of the LN, and with regulatory breakthrough in South Korea as well as in other areas, it is possible that Bitcoin may experience renewed interest from the public and institutions alike in the later part of the year, or further down the line. Bitcoin failed a key retest at the $12K level, and it has been all downhill from there. To make things worse, this appears to be a clear double top at $12K, followed by a decisive break below $10K. The price action looks very negative and suggests we may not see prices above $10K for some time. Also, the clear downtrend may take Bitcoin significantly lower. I am not sure a retest of the $5-6k level will hold this time. Therefore, it is possible that Bitcoin may be headed considerably lower in the short term. On the 10-day chart we can clearly see the massive down volume spike that occurred during the Binance/SEC statement sell-off. What makes this disturbing is the fact that almost no buying interest followed the massive selling, suggesting we may not be anywhere near a bottom yet. However, one constructive element on the chart is the possible double bottom setup at $8,500. This level needs to hold, and if does not Bitcoin will very likely fall through $8K, and cascade lower to at least the $5-6K level, possibly lower. Bitcoin’s loss of popularity is a significant issue when it comes to price stability in the short to intermediate term. Moreover, certain detrimental developments are putting additional pressure on the cryptocurrency world, and are causing prices to cascade lower. In addition to the seemingly negative fundamental developments surrounding Bitcoin, the technical setup appears to be deteriorating as well. Bitcoin’s apparent loss of popularity is impacting sentiment, which is causing prices to head lower. This phenomenon is likely to persist until something renews mass interest in Bitcoin. This could be further adoption of the LN, introduction of Bitcoin ETFs in the U.S., regulatory breakthroughs, large institutional investments, amongst other constructive developments. While these are likely to materialize in time, there is no guarantee they will emerge any time soon. Therefore, Bitcoin is likely to trend lower for now, and it may not see $10K for some time. I remain constructive on Bitcoin long term. Moreover, certain positive developments could spark a major Bitcoin rally sometime in the latter half of this year. But for now, it appears Bitcoin is going lower, it may be destined to retest the $5-6K level, and given the ominous technical setup there is no guarantee that this level will hold this time. I sold half of my Bitcoins when the price broke below $10K. I now hold a relatively small position, and plan to add at lower prices. To receive real time updates, and get more information about this idea as well as other topics, please visit the Albright Investment Group trading community. Join us and receive access to exclusive content, trade triggers, trading strategies, price action alerts, and price targets. These value-adding features are available only to members of our trading community and are not typically discussed in public articles.